The Avon ZZR design brief was immense. “To develop the fastest dry weather, track orientated, roa.. The V-shaped tread design of SV-2 tyres ensure for added security in all driving conditi.. Developed for racing, proven winner with top teams and drivers in major international championshi.. 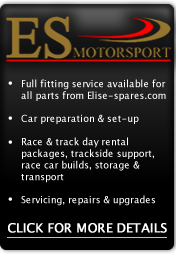 This kit converts the original Lotus Elise S2 wheel bolts to a stud and wheel nut setup Ideal..